Surely someone has had this experience before. I’ve coded a few modules, just to share with friends, but I’ve not included the CEP before. I downloaded 2.65 and added all of it to the appropriate folders, but I’m getting tlk errors. I don’t know exactly what’s gone wrong. I really just want to use it to take advantage of the new placeables, monsters, tilesets, skyboxes, etc. I’m not seeing those when I enter the toolset. Would someone be kind enough to help me out? In case “Make sure that the files are for sure-for sure in the right place” doesn’t lead to a fix - could you post a screenshot of your Module Properties -> Custom Content tab, and specify what the error messages you’re getting say? Maybe we can spot something that’s off. and I usually choose the highlighted module. I’m guessing that’s what I’m supposed to do, and then change the module name later. I’ve tried all of them with no luck. As you can see there are no .tlk files to even choose from there. By the way, there are over 40 .hak files in my hak folder.maybe this module only pulls those - not sure. The tlk files go in the tlk folder. If this is for 1.69/diamond this folder is in the install folder for NwN. If it is for EE the tlk folder is in your documents/Neverwinter Nights folder. 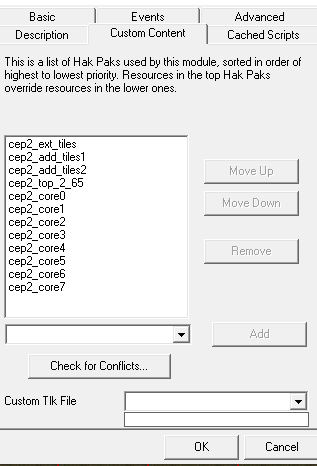 When you extracted the CEP to its own folder there would be several sub folders created. Go into the one called tlk and copy all the files in there to your tlk folder. Then read the readme.txt file that came with the CEP. Let’s go through the warnings. The 1st one tells you you are missing a tlk file from the talk folder. This means you didn’t put the file there. The second warning is a hold-over from the early days of NwN. Just click Yes and ignore it.